‘Revival always begins inside the church’. It’s an observation that has been made by great evangelical preachers such as C.H. Spurgeon (1834-1892) and Martyn Lloyd Jones (1899-1981). Their historical observation is that spiritual awakening in society usually begin with spiritual awakening among Christians and in churches. God’s people are filled with a renewed hunger for godliness, a new fervency in prayer, and a fresh enthusiasm to hear God’s word. We should expect that God would want to change us before he changes others through us. I have previously written about how godliness is the most practical thing in the world. The Bible tells us that ‘godliness has value for all things’ (1 Timothy 4:7) which means that it has value for mission. But how does godliness have value for mission? Many answers could be given. I believe this is the fundamental one: God delights to use obedient children to carry out his will. So if you want be effective in mission, obey God in everything. This is seen in the obedient Son, Jesus, who came to do his Father’s will (Hebrews 10:5-7). Jesus is the Son with whom God was ‘well pleased’ (Matthew 3:17). The Father’s delight in his Son is central to Jesus’ mission. Jesus came to do the Father’s will in saving the world, and he received resurrection, glory and universal lordship as a result (Philippians 2:5-11). God the Father did not regard his Son as just the necessary mechanism of achieving salvation. Rather, the Father took enormous delight in sending Jesus and in joyfully watching his victorious obedience. Christians are adopted into God’s family (Galatians 4:5-7). As extraordinary as it is to say, we share in Jesus’ relationship to God the Father! As adopted sons we are to imitate Jesus’ godly obedience to the Father and continue Jesus’ gospel-mission until he returns. We must strive to be the kind of children in whom God delights to carry out his will. “Everyone who confesses the name of the Lord must turn away from wickedness.” In a large house there are articles not only of gold and silver, but also of wood and clay; some are for special purposes and some for common use. Those who cleanse themselves from [wickedness] will be instruments for special purposes, made holy, useful to the Master and prepared to do any good work. Do you want to do good works? If you are a Christian the answer is surely yes! We should be eager to put ourselves at God’s disposal in his service. It is the greatest privilege to serve God and being part of his plans. But if we are serious about that then the point is clear: we must throw off sin and pursue holiness. We must strive to be the kind of instrument that our holy God finds fitting for the holy work of sharing the gospel with the world. Every morning I make coffee for my wife and myself. Sometimes one of my children is involved, but I get the job done either way. You might say that my children help me, but truthfully their feeble efforts are such that they merely “help” me. I really enjoy my children getting involved making coffee with me. It is a delight to do things with them since they are my children and I love them. But their involvement has nothing to do with what they contribute to the task. It’s still me making the coffee and I’ll get it done with or without them. In fact, I’ll do it far more quickly and with far less mess if I do it on my own! The Bible is clear that the mission of the gospel is God’s work, not ours. God delights to use the efforts of his children in his mission. He could, doubtless, do it far more efficiently without us and certainly with a lot less mess! We aren’t even the only created beings that God has in his service. God’s angels have a proven track record of faithfully communicating God’s will to humanity. He isn’t stuck just using us to save others! But God is our Father and he delights to have us involved in his work of winning sinners to salvation. There are two main things that make it more likely that children will be involved in my coffee-making work. First, my children’s behavior generally must be such that I want them helping alongside me. Bratty behavior makes it difficult to delight in a child’s assistance. Second, they are far more likely to be involved when they ask to be. 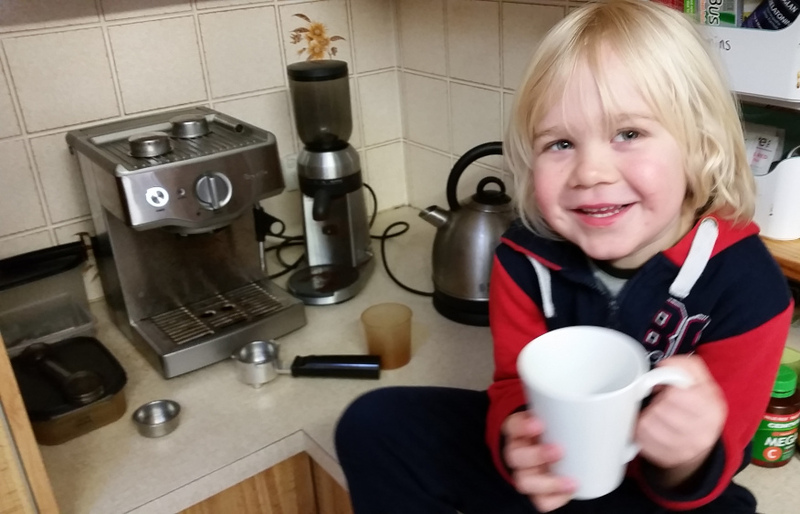 When my 3-year old asks “daddy, can I help you make coffee?” it is very likely that he will be involved that day. The same holds true for us. We should examine ourselves: what sins are presently polluting our lives and compromising our cleanliness before God? What do we need to confess and repent of? Are we asking God daily to be involved in his work of calling people to himself through the gospel? These are the characteristics of children whom God delights to use to achieve his will.